Toki Pona is an oligoisolating constructed language, created by Canadian linguist and translator Sonja Lang as a philosophical language for the purpose of simplifying thoughts and communication. It was first published online in 2001 as a draft, then in its complete form in the book Toki Pona: The Language of Good in 2014. A small community of speakers developed in the early 2000s and has continued to grow larger over the years, especially after the release of the official book. Much of the activity takes place online in chat rooms, on social media, and in other groups, although there have been a few organized group meetings in person over the past couple of years. One of Toki Pona’s main goals is a focus on minimalism. Like a pidgin, it focuses on simple concepts and elements that are universal among cultures. Lang designed Toki Pona to express maximal meaning with minimal complexity and to promote positive thinking. The language has 120–125 root words and 14 phonemes designed to be easy to pronounce for speakers of various language backgrounds. Although it was not intended as an international auxiliary language, it may as well function as one. Inspired by Taoist philosophy, the language is designed to help users focus on the essentials and remove complexity from the thought process. Despite the small vocabulary, speakers are able to understand and communicate with each other, mainly relying on context and combinations of several words to express more specific meanings. The name of the language is compounded with toki (language), derived from Tok Pisin tok, which itself comes from English talk; and pona (good/simple), from Esperanto bona (good), ultimately from Latin bonus. Sonja Lang originally developed Toki Pona as a coping mechanism for depression and published an early version of the language online in 2001. As the community grew, a group of speakers, along with Sonja Lang, formed a Yahoo! group on March 24, 2002 which they used until 2009 when it was moved to a forum on a phpBB site. From 2002 to 2009, members of the group discussed the language with one another in English, Toki Pona, and Esperanto, proposed changes, and talked about the resources on the tokipona.org site. At its peak member count, the group had a little over 500 members. A Wikipedia (called “Wikipesija” in the language) written in Toki Pona existed for a few months but was closed in 2004 and moved to Wikia. As speakers used Toki Pona in chat groups during the earlier years, it began to evolve, and Lang worked with the community to gradually improve and polish the language. For this reason, a member of the community, Bryant J. Knight or “jan Pije”, began developing his Toki Pona website around 2002. Many members of the community use it as a resource for teaching and learning the language. Knight created his own lessons and published them on his site to reflect the changes in the language that had occurred, and he continued to update them until the most recent update in 2017. Lang began writing the official book, Toki Pona: The Language of Good, along with help from a few members from the community, and published it a few years later in 2014. The official book coined a new word pu which means “interacting with the official Toki Pona book.” The book demonstrates the way Lang uses the language, and it helped to anchor some of the ideas about the grammar of Toki Pona and how it functions. Since the publication of the book, the number of speakers and learners of Toki Pona has increased dramatically. The community continues to thrive and interact with each other on various sites and apps on the internet. In 2007 and 2017 the members of the community applied for an ISO 639-3 code, which was rejected in both cases. The reason for the latter one being that the language "does not appear to be used in a variety of domains nor for communication within a community which includes all ages." As of today, a page on Wikia has been dedicated to collecting various references about Toki Pona so that the next application could be successful. Toki Pona was chosen for the first version of the vocabulary for the ROILA project in 2010. The purpose of this project was to study the use of an artificial language on the accuracy of machine speech recognition and it was revealed that the modified vocabulary of Toki Pona significantly outperformed English whereas it was not that successful while evaluating the grammar. It has also been used in other studies on language learning. Toki Pona has nine consonants (/p, t, k, s, m, n, l, j, w/) and five vowels (/a, e, i, o, u/). The first syllable of a word is stressed. There are no diphthongs, contrasting vowel length, consonant clusters, or tones. The statistical vowel spread is fairly typical when compared with other languages. Counting each root once, 32% of vowels are /a/, 25% are /i/, with /e/ and /o/ a bit over 15% each, and 10% are /u/. 20% of roots are vowel initial. The usage frequency in a 10kB sample of texts was slightly more skewed: 34% /a/, 30% /i/, 15% each /e/ and /o/, and 6% /u/. Of the syllable-initial consonants, /l/ is the most common, at 20% total; /k, s, p/ are over 10%, then the nasals /m, n/ (not counting final N), with the least common, at little more than 5% each, being /t, w, j/. The high frequency of /l/ and low frequency of /t/ is somewhat unusual among the world's languages. The fact that /l/ occurs in the grammatical particles la, li, ala suggests that its percentage would be even higher in texts; the text-based stats cited above did not specifically consider initial consonants, but indicate that /l/ was about 25%, while /t/ doubled its frequency to just over 10% (/k/, /t/, /m/, /s/, /p/, respectively, ranged over 12% to 9% each, with /n/ unknown, and the semivowels /j/ and /w/ again coming in last at 7% each). All syllables are of the form (C)V(N), i.e. optional consonant + vowel + optional final nasal, or V, CV, VN, CVN. As in most languages, CV is the most common syllable type, at 75% (counting each root once). V and CVN syllables are each around 10%, while only 5 words have VN syllables (for 2% of syllables). In both the dictionary and in texts, the ratio of consonants to vowels is almost exactly one-to-one. Most roots (70%) are disyllabic; about 20% are monosyllables and 10% trisyllables. This is a common distribution, and similar to Polynesian. Proper nouns are usually converted into Toki Pona proper adjectives using a set of guidelines. The native, or even colloquial, pronunciation is used as the basis for the subsequent sound conversion. Thus, England or English become Inli and John becomes San. The nasal at the end of a syllable can be pronounced as any nasal stop, though it is normally assimilated to the following consonant. That is, it typically occurs as an [n] before /n/, /t/, /s/ or /l/, as an [m] before /m/, /p/ or /w/, as an [ŋ] before /k/, and as an [ɲ] before /j/. Because of its small phoneme inventory, Toki Pona allows for quite a lot of allophonic variation. For example, /p t k/ may be pronounced [b d ɡ] as well as [p t k], /s/ as [z] or [ʃ] as well as [s], /l/ as [ɾ] as well as [l], and vowels may be either long or short. Both its sound inventory and phonotactics (patterns of possible sound combinations) are found in the majority of human languages and are therefore readily accessible. For example, */ji, wu, wo/ are also impossible in Korean and other languages, which is convenient when writing Toki Pona in alternative scripts. 14 Latin letters, a e i j k l m n o p s t u w, are used to write the language. They have the same values as in the International Phonetic Alphabet: j sounds like English y, and the vowels are like those of Spanish or Italian. Capital initials are used to mark proper adjectives, while Toki Pona roots are always written with lowercase letters, even when they start a sentence. Two logographic writing systems, sitelen pona and sitelen sitelen, were later introduced and included in Toki Pona: The Language of Good. The former, in which each word is represented by a symbol, was devised by Lang herself. Proper names are written inside a cartouche-like symbol using a series of symbols, where each symbol represents the first letter of its word. Symbols representing a single adjective may be written inside or above the symbol for the preceding word that they modify. 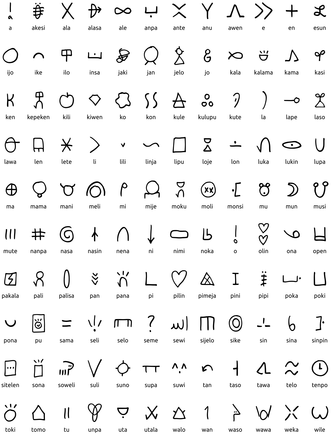 The symbol of the language is written in sitelen pona, with the symbol for pona written inside the symbol for toki. The latter system, sitelen sitelen, was created by Jonathan Gabel. 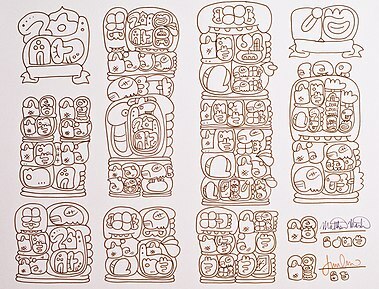 It is more elaborate and visually resembles the Mayan script. This non-linear logographic system uses two separate methods to form words: images representing whole words, and images that represent syllables, composed of graphemes representing each phoneme. In addition, the community has adapted other scripts to write Toki Pona, such as Korean Hangul, the Arabic script, and J. R. R. Tolkien's Tengwar. Toki Pona’s word order is Subject-Verb-Object. The word li introduces predicates, e introduces direct objects, prepositional phrases follow the objects, and la phrases come before the subject to add additional context. Some roots are particles for grammatical functions, while others have lexical meanings. The lexical roots do not fall into well defined parts of speech; rather, they may generally be used as nouns, verbs, modifiers, or interjections depending on context or their position in a phrase. For example, ona li moku may mean "they ate" or "it is food". A sentence may be an interjection, statement, wish/command, or question. Some interjections are a, ala, ike, jaki, mu, o, pakala, pona, toki, etc. and can stand alone as a sentence. Statements follow the normal structure of subject predicate with an optional la phrase at the beginning. The word li always comes before the predicate unless the subject is mi or sina by itself. The direct object marker e comes before the direct objects. More li and e markers can introduce new predicates or direct objects. Vocative phrases come before the main sentence and are marked with o at the end of the phase, after the addressee. In commands, the word o comes before a verb to express a second person command. It can also replace li, or come after the subjects mi or sina, to express wishes. There are two ways to form yes-no questions in Toki Pona. The first method is to use the “verb ala verb” construction in which ala comes in between a duplicated verb, auxiliary verb, or other predicator. Another way to form a yes-no question is to put “anu seme?” (lit. or what?) at the end of a sentence. It is important to note that questions cannot be made by just putting a question mark at the end of a sentence. Non-polar questions are formed by substituting the unknown information with the interrogative word seme. Toki Pona has basic pronouns: mi (first person), sina (second person), and ona (third person). The pronouns do not specify number or gender. Therefore, ona can mean "he", "she", "it", or "they". In practice, Toki Pona speakers use the phrase mi mute to mean "we", though the number is often discernible from context and thus only mi is necessary. Likewise, ona mute may mean "they" and sina mute would mean "you" (plural). Whenever the subject of a sentence is either of the unmodified pronouns mi or sina, then li is not used to separate the subject and predicate. Nouns do not decline according to number. jan can mean "person", "people", or "the human race" depending on context. 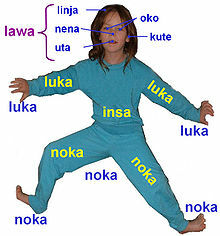 Toki Pona does not use isolated proper nouns; instead, they must modify a preceding noun. For this reason they are called "proper adjectives"; they are functionally the same as compound nouns. For example, names of people and places are used as modifiers of the common roots for "person" and "place", e.g. ma Kanata (lit. "Canada country") or jan Lisa (lit. "Lisa person"). Phrases in Toki Pona are head-initial; modifiers always come after the word that they modify. This trait resembles the typical arrangement of adjectives in Spanish and Arabic and contrasts with the typical English structure. Therefore kasi kule, literally "plant of colour", always refers to a plant that is colourful. kasi kule poki, literally "plant of colour of container" refers to a colourful plant that comes in a container, i.e. a potted flower. In the other direction, the English expression "plant pot" refers to a container, so it must be rendered into Toki Pona with the word meaning "container" at the beginning, i.e. poki kasi (lit. "pot of plant"). A "flower pot" would be poki pi kasi kule (literally "pot of plant colour"). In Toki Pona, "N A1 A2" (where N represents a noun and A1 and A2 represent modifiers) is always understood as ((N A1) A2), i.e. an A1 N that is A2: E.g., jan pona lukin = ((jan pona) lukin), a friend watching, rather than (jan (pona lukin)), a good-looking person. This can be changed with the particle pi, "of", which groups the following adjectives into a kind of compound adjective that applies to the head noun, which leads to jan pi pona lukin = (jan (pona lukin)), "good-looking person." Demonstratives, numerals, and possessive pronouns follow other modifiers. Toki Pona does not inflect verbs according to person, tense, mood, or voice, as the language features no inflection whatsoever. Person is inferred from the subject of the verb; time is inferred from context or a temporal adverb in the sentence as a subclause. The closest thing to passivity in Toki Pona is a structure such as "(result) of (subject) is because of (agent)." Alternatively, one could phrase a passive sentence as an active one with the agent subject being unknown. Prepositions can be used as a kind of verb. For example, tawa means "to" as a preposition and "to go", "to move" or "to go to" as a verb; lon means "in" or "at" as a preposition and "to be in/at" or "to exist" or "to be true" as a verb; kepeken means "using" or "with" (in the sense of the instrumental case) as a preposition and "to use" as a verb. Verbs from prepositional roots have their objects right after them without the direct object marker e, similar to when they are used as a preposition. Compare mi moku lon tomo mi for "I am eating at my house" and mi lon tomo mi for "I am at my house." Using the direct object marker e with a prepositional verb makes it causative, e.g. mi tawa e sijelo mi means "I make my body move". An exception is often made for kepeken, which some speakers use with e without a causative sense. E.g. both mi kepeken ilo and mi kepeken e ilo are used to say "I am using a tool." The vocabulary is designed around the principles of living a simple life without the complications of modern civilization and heavily relies on context and metaphor. Toki Pona is generally said to have around 120, 123, or 125 root words. Each of these is polysemous and can be thought of as a group of similar concepts, so suli not only means "big" or "long", but also "important". To express more complex thoughts, the roots can be combined. For example, jan pona can mean friend, although it literally translates as "good person", and telo nasa, which literally means "strange water" or "liquid of craziness", would be understood to mean "alcohol" or "alcoholic beverage" depending on the context. The verb "to teach" can be expressed by pana e sona, which literally means "to give knowledge". Essentially identical concepts can be described by different words as the choice relies on the speaker's perception and experience. Toki Pona has five root words for colours: pimeja (black), walo (white), loje (red), jelo (yellow), and laso (blue). Each word represents multiple shades: laso refers to colours as light as cornflower blue or as dark as navy blue, and includes tints of both green, blue, and cyan. Although the simplified conceptualization of colours tends to exclude a number of colours that are commonly expressed in Western languages, speakers sometimes may combine these five words to make more specific descriptions of certain colours. For instance, "purple" may be represented by combining laso and loje. The phrase laso loje means "a reddish shade of blue" and loje laso means "a bluish shade of red". Toki Pona has root words for one (wan), two (tu), and many (mute). In addition, ala can mean zero, although its more literal meaning is "no" or "none," and ale "all" can express an infinite or immense amount. The simplest number system uses these five roots to express any amount necessary. For numbers larger than two, speakers would use mute which means "many". A more complex system expresses larger numbers additively by using phrases such as tu wan for three, tu tu for four, and so on. This feature purposely makes it impractical to communicate large numbers. An alternate system proposed by Lang's official 2014 description of Toki Pona for larger numbers uses luka (literally "hand") to signify "five", mute (literally "many") to signify "twenty" and ale (literally "all") to signify "100". For example, using this structure ale tu would mean "102" and mute mute mute luka luka luka tu wan would signify "78". Some words have obsolete synonyms. For example, nena replaced kapa (protuberance) early in the language's development for unknown reasons. Later, the pronoun ona replaced iki (he, she, it, they), which was sometimes confused with ike (bad). Similarly, ali was added as an alternative to ale (all) to avoid confusion with ala (no, not) among people who reduce unstressed vowels, though both forms are still used. Originally, oko meant "eye" and lukin was used as a verb "see". The meanings were later merged into lukin, oko being the alternative. Most users, however, tend to follow the traditional definitions. Words that have been simply removed from the lexicon include leko (block, stairs), monsuta (monster, fear), majuna (old), and pata (sibling). Besides nena and ona, which replaced existing roots, a few roots were added to the original 118: pan (grain, bread, pasta, rice), esun (market, shop, trade), alasa, (hunt, gather), kipisi, (to cut), and namako (extra, additional, spice), another word for sin (new). kipisi is now considered outdated because it was not included in the official book, although some speakers still use the word. Toki Pona roots generally come from English, Tok Pisin, Finnish, Georgian, Dutch, Acadian French, Esperanto, Croatian, and Chinese (Mandarin and Cantonese). Although only 14 roots (12%) are listed as derived from English, a large number of the Tok Pisin, Esperanto, and other roots are transparently cognate with English, raising the English-friendly portion of the vocabulary to about 30%. 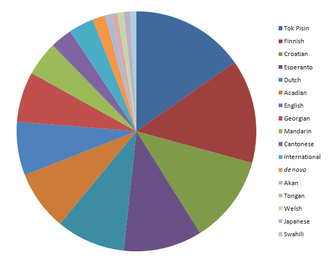 The portions of the lexicon from other languages are 15% Tok Pisin, 14% Finnish, 14% Esperanto, 12% Croatian, 10% Acadian French, 9% Dutch, 8% Georgian, 5% Mandarin, 3% Cantonese; one root each from Welsh, Tongan (an English borrowing), Akan, and an uncertain language (apparently Swahili); four phonesthetic roots (two which are found in English, one from Japanese, and one which was made up); and one other made-up root (the grammatical particle e). Signed Toki Pona, or toki pona luka, is a manually coded form of Toki Pona. Each word and letter has its own sign, which is distinguished by the hand shape, location of the hand on the body, palm or finger orientation, and the usage of one or both hands. Most signs are performed with the right hand at the required location. A few signs, however, are performed with both hands in a symmetrical way. To form a sentence, each of the signs is performed using the grammar and word order of Toki Pona. The language is fairly known among Esperantists, who often offer courses and conversation groups at their meetings. In 2007, Lang was reported to have said that at least 100 people speak Toki Pona fluently and estimated that a few hundred have a basic knowledge of the language. In 2014, 17 people tried to learn Toki Pona in 48 hours at an Actual Fluency meetup. The following year, several people met in the Czech Republic to enjoy studying and using the Toki Pona language together. One-hour courses of Toki Pona were taught on various occasions by the Massachusetts Institute of Technology during their Independent Activities Period, and in 2018 two courses took place at a polyglot festival in Slovakia. There is an official Facebook group called toki pona created by Sonja Lang, and an unofficial Facebook group called toki pona taso, which means "only Toki Pona". In the toki pona group, users communicate primarily in English about their interest in Toki Pona. In the toki pona taso group, users communicate solely in Toki Pona about various topics. As of January 2019, the toki pona group has over 3800 members, and the toki pona taso group has over 650 members. Starting in March 2017, several members of the Toki Pona Facebook group began collaborating on a "toki pona central hub document" where much of the literature, lessons, resources, social media, and other material in or about Toki Pona could be found. From this document, a website called "tomo pona" opened up, which is written entirely in Toki Pona and shares links to various other sites pertaining to Toki Pona. tomo pona now serves as a central hub for the Toki Pona community. Toki Pona is also a language available on Amikumu with around 400 users in 2019. In addition, there are groups also on Telegram and Discord, where users discuss or practice Toki Pona. Toki Pona speakers frequently use Twitter and Reddit as well. jan ali li kepeken e toki sama. jan li kama tawa nasin pi kama suno li kama tawa ma Sinale li awen lon ni. jan li toki e ni: "o kama! mi mute o pali e kiwen. o seli e ona." jan mute li toki e ni: "o kama! mi mute o pali e tomo mute e tomo palisa suli. sewi pi tomo palisa li lon sewi kon. nimi pi mi mute o kama suli! mi wile ala e ni: mi mute li lon ma ante mute." jan sewi Jawe li kama anpa li lukin e ma tomo e tomo palisa. jan sewi Jawe li toki e ni: "jan li lon ma wan li kepeken e toki sama li pali e tomo palisa. tenpo ni la ona li ken pali e ijo ike mute. mi wile tawa anpa li wile pakala e toki pi jan mute ni. mi wile e ni: jan li sona ala e toki pi jan ante." jan sewi Jawe li kama e ni: jan li lon ma mute li ken ala pali e tomo. nimi pi ma tomo ni li Pape tan ni: jan sewi Jawe li pakala e toki pi jan ali. jan sewi Jawe li tawa e jan tawa ma mute tan ma tomo Pape. No one can understand my suffering. O poetry! My only friend. This ink is my blood, is my life. And Darkness shall reign forevermore. ^ Lucas, Jamie (2015-11-22). "Psych 256: Cognitive Psychology FA 15 – Speak now". PennState. Retrieved 2019-01-14. ^ "ISO – Websites and apps with a Toki Pona interface". Wikipesija. Retrieved 2019-01-21. ^ a b c d Roberts, Siobhan (2007-07-09). "Canadian has people talking about lingo she created". The Globe and Mail. Retrieved 2017-03-10. ^ a b c Dance, Amber (2007-08-24). "In their own words – literally / Babel's modern architects". Los Angeles Times. Archived from the original on January 3, 2013. Retrieved 2007-08-29. ^ Sunderarajan, Badri (2017-12-17). "The Littlest Language". Snipette. Retrieved 2019-01-11. ^ a b c Thomas, Simon (2018-03-27). "Exploring Toki Pona: do we need more than 120 words?". Oxford Dictionaries. Retrieved 2019-02-03. ^ Јовановић, Тијана (Tiyana Yovanovich) (2006-12-15). "Вештачки језици" [Artificial languages]. Политикин Забавник (Politikin Zabavnik) (in Serbian) (2862). ^ Sunderarajan, Badri (2017-12-16). "The Littlest Language: What you speak is what you think. Or is it the other way round?". Medium. Retrieved 2019-02-10. ^ Okrent, Arika (2009). "The Klingons, the Conlangers, and the Art of Language – 26. The Secret Vice". In the Land of Invented Languages. New York: Spiegel & Grau. ISBN 978-0-385-52788-0. ^ Malmkjær, Kirsten (2010). "Artificial languages". The Routledge Linguistics Encyclopedia (3rd ed.). New York: Routledge. p. 34. ISBN 9780415424325. OCLC 656296619. ^ "Toki Pona". Langmaker. Retrieved 2019-01-13. ^ a b c Clifford, John (2011-03-22). "Introduction (draft)". nimi pi toki pona. Retrieved 2019-01-25. ^ Lang, Sonja. ""Why Toki Pona?"". lipu pi jan Pije. Retrieved 2017-10-20. Toki Pona follows the principles of Taoism, which advocates a simple, honest life and noninterference with the course of natural events. ^ a b Morin, Roc (2015-07-05). "How to Say Everything in a Hundred-Word Language". The Atlantic. Retrieved 2019-01-07. ^ a b Rogers, Steven D. (2011). "Part I: Made-Up Languages – Toki pona". A Dictionary of Made-Up Languages. United States of America: Adams Media. ISBN 978-1440528170. ^ a b c d e f g h i j k l m n o p Blahuš, Marek (November 2011). Fiedler, Sabine (ed.). "Toki Pona: eine minimalistische Plansprache" [Toki Pona: A Minimalistic Planned Language] (PDF). Interlinguistische Informationen (in German). Berlin. 18: 51–55. ISSN 1432-3567. ^ a b c d "Toki Pona Word Origins". UC Team. Retrieved 2019-01-12. ^ jansegers (2018-09-17). "Toki Pona Root Word Etymology Page". Plume – Toki Pona : a conlang and its speakers. Retrieved 2019-02-03. ^ "bona – Esperanto". Wiktionary. 2018-12-12. Retrieved 2019-01-25. ^ a b Payack, Paul J.J. (2008). "Constructed Languages". A Million Words and Counting: How Global English Is Rewriting The World. New York: Kensington Publishing Corp. ISBN 978-0-8065-3560-9. ^ "toki pini pi kulupu Jaku - Toki Pona Forums". forums.tokipona.org. Retrieved 2019-01-11. ^ "tokipona : Toki Pona". web.archive.org. 2013-04-30. Retrieved 2019-01-11. ^ "Wikipedia". Toki Pona Forums. 2007. Retrieved 2019-01-15. ^ "lipu lawa". Wikipedia. 2004-11-22. Retrieved 2019-01-12. ^ "List of Wikipedias – Deprecated, moved and other – Moved and deleted". Wikipedia. 2018-12-25. Retrieved 2019-01-15. ^ "lipu pi jan Pije". tokipona.net. Retrieved 2019-01-11. ^ Lang, Sonja (2014). Toki Pona: The Language of Good. Tawhid. ISBN 9780978292300. OCLC 921253340. ^ "Change Request Documentation: 2017-035". SIL ISO 639-3. Retrieved 2019-01-10. ^ "ISO". Wikipesija. Retrieved 2019-01-10. ^ Mubin, Omar; Bartneck, Christoph; Feijs, Loe (2010). "Towards the Design and Evaluation of ROILA: A Speech Recognition Friendly Artificial Language". Advances in Natural Language Processing. LNCS 6233/2010: 250–256. doi:10.1007/978-3-642-14770-8_28 – via ResearchGate. ^ Saerbeck, Martin; Schut, Tom; Bartneck, Christoph; Janse, Maddy D. (2010). "Expressive Robots in Education Varying the Degree of Social Supportive Behavior of a Robotic Tutor". Proceedings of the 28th International Conference on Human Factors in Computing Systems, CHI 2010: 1613–1622. doi:10.1145/1753326.1753567 – via ResearchGate. ^ Mubin, Omar; Shahid, Suleman; Bartneck, Christoph; Krahmer, Emiel; Swerts, Marc; Feijs, Loe (2009). "Using Language Tests and Emotional Expressions to Determine the Learnability of Artificial Languages". CHI '09 Extended Abstracts on Human Factors in Computing Systems. doi:10.1145/1520340.1520620 – via ResearchGate. ^ Mubin, Omar; Bartneck, Christopher; Feijs, Loe (2009). "What you say is not what you get: Arguing for Artificial Languages Instead of Natural Languages in Human Robot Speech Interaction". Spoken Dialogue and Human-Robot Interaction Workshop at IEEE RoMan 2009, Toyama. doi:10.13140/RG.2.2.35509.68325 – via ResearchGate. ^ "ISO – Academia". Wikipesija. Retrieved 2019-02-03. ^ "Phoneme frequency table / Ofteco de fonemoj". lipu pi toki pona pi jan Jakopo. Archived from the original on 2007-11-14. ^ Knight, Bryant (2017-08-31). "o kama sona e toki pona! Lesson 9: Gender, Unofficial Words, Commands". lipu pi jan Pije. Retrieved 2019-01-25. ^ Knight, Bryant. "Phonetic conversion of proper names". lipu pi jan Pije. Retrieved 2019-01-15. ^ "Updated jan Pije's lessons/Lesson 2 Pronunciation - Wikibooks, open books for an open world". Wikibooks. Retrieved 2018-08-05. ^ "Toki Pona". Omniglot: the online encyclopedia of writing systems & languages. Retrieved 2019-01-13. ^ Knight, Bryant (2017-08-31). "Toki Pona Hieroglyphs". lipu pi jan Pije. Retrieved 2019-01-07. ^ "Sitelen". Omniglot: the online encyclopedia of writing systems & languages. Retrieved 2019-01-11. ^ "ISO – Writing systems". Wikipesija. Retrieved 2019-01-13. ^ a b "3. Toki Pona Text – Grammar and Vocabulary". Language Creation Society. Retrieved 2019-01-25. ^ a b c d e f g h i j k l Warnke, Robert. "Toki Pona - Lessons and Dictionary". jan Lope github. Retrieved 2019-01-25. ^ Clifford, John (2010-09-04). "Parts of speech". nimi pi toki pona. Retrieved 2019-01-25. ^ "o kama sona e toki pona! Lesson 4: Direct Objects; Compound Sentences". lipu pi jan Pije. 2017-08-31. Retrieved 2019-01-25. ^ a b Clifford, John (2016-03-18). "tp FAQ 6 How do you make a question in tp?". nimi pi toki pona. Retrieved 2019-01-25. ^ Martin, Matthew (2007-09-11). "Toki Pona: Pronouns unleashed". My Suburban Destiny. Retrieved 2019-01-25. ^ Knight, Bryant (2017-08-31). "o kama sona e toki pona! Lesson 5: Adjectives, Adverbs". lipu pi jan Pije. Retrieved 2019-01-26. ^ a b c Yerrick, Damian (2002-10-23). "Toki Pona li pona ala pona? A review of Sonja Kisa's constructed language Toki Pona". Pin Eight. Retrieved 2007-07-20. ^ "Toki Pona language – Syntax". Encyclopedian. 2008-12-03. Retrieved 2019-01-26. ^ Bramley, Ellie Violet (2015-01-08). "What happened when I tried to learn Toki Pona in 48 hours using memes". The Guardian. Retrieved 2019-01-07. ^ Griffin, Sarah (2018-08-18). "Podcast of the week: The smallest language in the world". The Irish Times. Retrieved 2019-01-07. ^ Zorrilla, Natalia C. (2018). "Still Hoping: The Relation of International Auxiliary Languages to Worldview and Perception". doi:10.31235/osf.io/sj24a – via SocArXiv. ^ Originally 118 roots, with several roots added later. ^ Синящик, Анна (Anna Sinyashchik) (2018-01-03). "Коротко и ясно. Как искусственный язык учит фокусироваться на главном" [Briefly and Clearly. How an Artificial Language Teaches to Focus on What's Important]. Фокус (Focus) (in Russian). ^ Козловский, Станислав (Stanislav Kozlovsky) (2004-07-20). "Скорость мысли (The Speed of Thought)". Компьютерра (Computerra) (in Russian). Retrieved 2007-07-20. ^ Knight, Bryant. "Toki Pona dictionary". lipu pi jan Pije. Retrieved 2019-01-13. ^ "Numbers". tokipona.net. Retrieved 2019-01-26. ^ Knight, Bryant (2011-12-27). "Updated jan Pije's lessons/Lesson 8 Negation, Yes - No Questions". Wikibooks. Retrieved 2019-01-25. ^ "o kama sona e toki pona! Lesson 15: The Body". lipu pi jan Pije. Retrieved 2019-01-13. ^ Knight, Bryant (2017-08-31). "Extinct words". lipu pi jan Pije. Retrieved 2019-01-13. ^ "Classic Word List (Improved!)". tokipona.net. Retrieved 2019-01-07. ^ a b Knight, Bryant (2017-08-31). 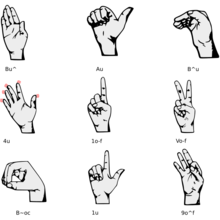 "Toki Pona Sign Language". lipu pi jan Pije. Retrieved 2018-09-16. ^ a b c "ISO – Conventions and gatherings where Toki Pona was actively used". Wikipesija. Retrieved 2019-01-24. ^ "ISO – Materials – Discussion forums". Wikipesija. Retrieved 2019-01-13. ^ "tomo pona". tomo pona. Retrieved 2017-07-21. ^ "toki". tomo pona. Retrieved 2018-04-07. ^ "ma tomo Pape". suno pona. Retrieved 2019-01-12. ^ "Toki Pona". Omniglot: the encyclopedia of writing systems & languages. Retrieved 2019-01-12. Lang, Sonja (2014). Toki Pona: The Language of Good. Tawhid. ISBN 978-0978292300. OCLC 921253340. Lang, Sonja (2016). Toki Pona: la langue du bien (in French). Tawhid. ISBN 978-0978292355. Cardenas, Eliazar Parra (2013). Toki pona en 76 ilustritaj lecionoj [Toki Pona in 76 illustrated lessons] (in Esperanto). Translated by Blahuš, Marek. ISBN 978-80-89366-20-0. Wikimedia Commons has media related to Toki Pona. ISO A Wikia page with many links to Toki Pona related websites.